Such a gorgeous place, y’all! I love this time period. I should, since my house was built in it. 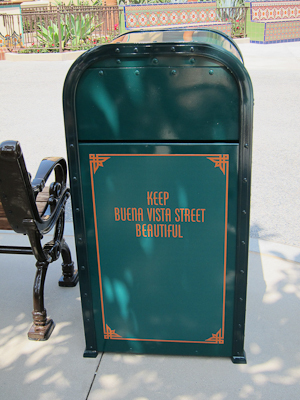 And I also love the Disney details, right down to the trash cans. 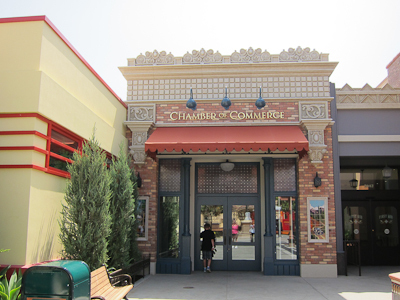 For those of you familiar with DCA’s original Sunshine Plaza entrance, which I personally disliked, Buena Vista Street could not possibly be more different. 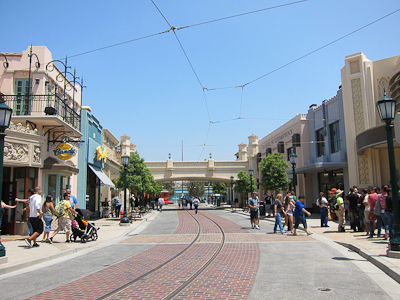 Buena Vista Street was made to look a lot like Main Street, and it does. What’s great about her is that she wanders through the stores like she’s shopping. 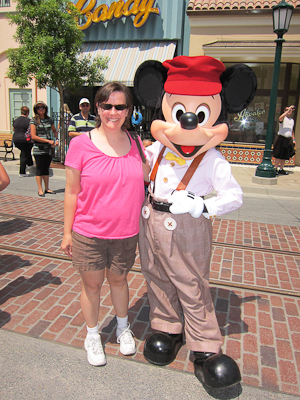 Even the characters have their dapper outfits on–something you don’t find on Main Street. See how my bangs are swept to one side there? I ended up with a sunburn on half of my forehead. Classy. 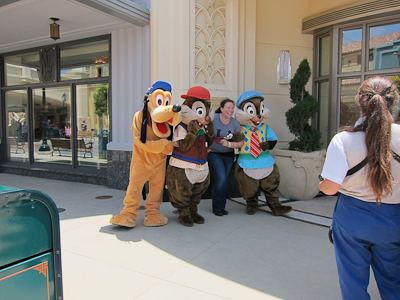 And even Chip and Dale. 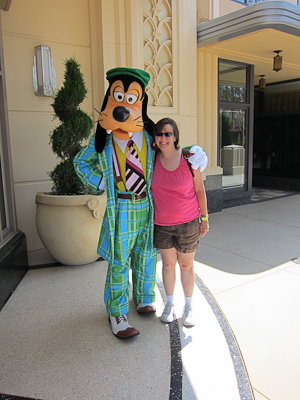 Although Pluto’s idea of dressing up is a little unimpressive. 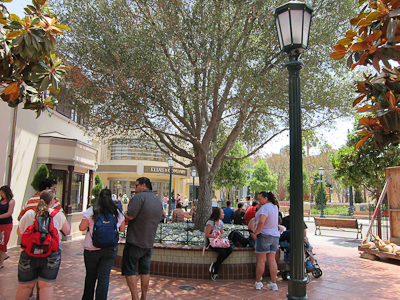 One fabulous thing Disney did with Buena Vista Street as well as Cars Land is to plant a TON of fully-grown trees. There’s a lot of nice shading in the area. Bugle! Who uses that word anymore? 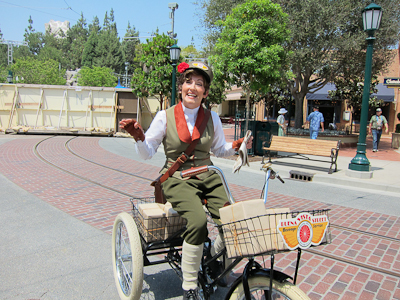 So much fun stuff on Buena Vista Street! Go see it! 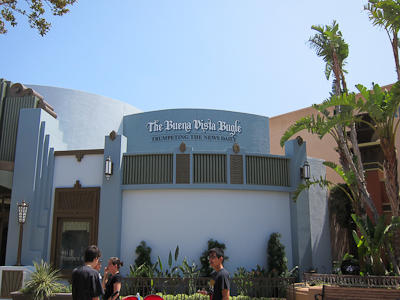 I love how everything, even the signs, buildings and fonts use that faux- art deco style. 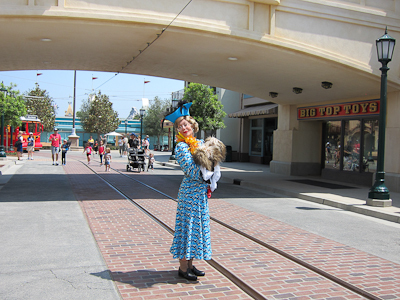 It it all reminiscent of the style at the Hollywood Studios in Florida. Shelby – the officers on BVS have the power to write you a citation! I was talking to an officer and noticed his ticket book, asked if he wrote people tickets and he wrote me up for “Unbridled Municipal Optimism” or some such. So ask an officer – it’s a great souvenir!